يقع فندق سوفيتل جولد كوست في برود بيتش, جولد كوست, هو خيار شائع بين المسافرين. يقع مركز المدينة المثير على بعد 4. Km فقط. سوف يعشق النزلاء موقع هذا الفندق، فهو قريب من أهم المعالم السياحية في المدينة كمثل Zoneleader Acupuncture & Chinese Medicine Clinic, برود بيتش مول, Haan Health Medical Centre . إن فندق سوفيتل جولد كوست حريص على توفير الراحة للنزلاء، فلا يوفر الموظفون جهداً في تقديم أفضل الخدمات وضمان حسن الاستقبال. يمكن لضيوف الفندق الاستمتاع بالميزات التالية على أرض الفندق: خدمة الغرف على مدار الساعة, مكتب الاستقبال على مدار الساعة, مرافق مخصصة لذوي الاحتياجات الخاصة, تسجيل وصول/خروج سريع, تخزين الأمتعة . يمكن للنزلاء الاختيار من ضمن مجموعة من الغرف المصممة بعناية لتعكس جواً من الراحة، والتي يتجاوز عددها 296. يمكنك الاستمتاع بالأجواء المريحة التي تقدمها حوض استحمام ساخن, شاطئ خاص, حمام سباحة خارجي, سبا, تدليك طوال النهار. يحظى فندق فندق سوفيتل جولد كوست بموقع ممتاز وخدمات يصعب منافستها. Definitely not what you expect from a 5 star hotel! Positive: breakfast - food and restaurant staff were amazing Negatives: We returned to our room from a day morning out at 13:45 and I room was still unserviced. $15 a night for parking (which we were not warned about upon check in) on top of the high prices per room was really not on. Hotel was decent, bathrooms were looking a little dated but the room was clean and very big. TV channel selection was also very good but some of the channels didn't have good reception, blurry and grainy. 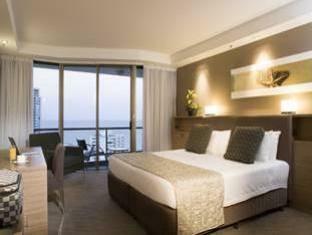 The location is great being in walking distance of some good restaurants, the beach and the casino. 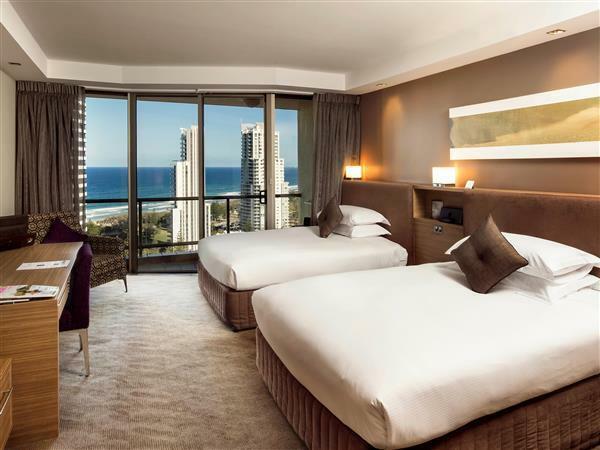 If you want to be away from the crowded Surfers Paradise area then the Sofitel in Broardbeach is an ideal location. 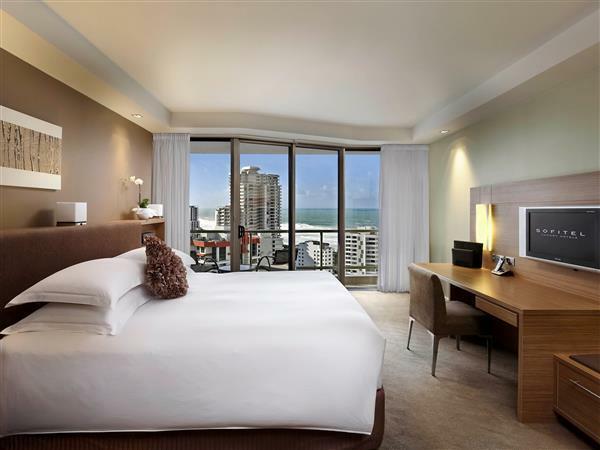 Great hotel with really nice room and within walking distance of the beach, local restaurants and shopping and just accross the road from the Jupitors Casino. 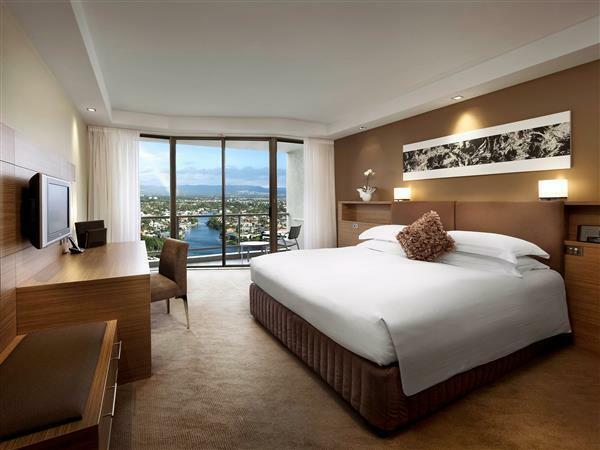 All major tourist attractions are very easy to access from the Sofitel and whenever I am on the Gold Coast I will continue to stay there. hotel which deserves its rating. thoroughly enjoyed our weekend stay as lift access was located in shopping centre. very accessible to locality for shopping beach and restaurants.very comfortable hotel with efficient staff. great parking access as well.ended our enjoyable day with a nightcap in the bar. I thouroughly recommend this hotel. Found it one of the best I have seen on the Gold Coast. Perfect for the family or weekend romantic traveller. Great if you wish to access the Jupiters Casino complex for a night out or show with the monorail connecting the two complexes. came here for the weekend with a girlfriend for a wedding. we really enjoyed the downstairs bar at the hotel. they had live jazz on sunday and we drank cocktails and ate tapas at the bar restaurant. really lovely friendly staff. wll thishotel it is what you come to expect from Sofitel, it is such a superb hotel from staff to to cleaness and service and the roomn design and furniture and all, it is wonderful, the location it is just perfect and there is not one this that i can put a fault on it. When my booking fell through due to being fully booked, the staff at Sofitel did everything they could to ensure I was still able to stay there. Then they upgraded me to an ocean view room and sent up a bottle of bubbles when they learned it was my 40th birthday. Also the beds were so amazingly comfortable, it was as close as I believe you could get to sleeping on a cloud. 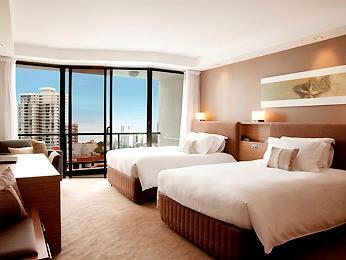 I would definitely stay here again and recommend to anyone visiting Broadbeach. It was brilliant and was a reminder of why I keep coming back whenever I need to stay on the GC. The service is just amazing. From the conference coordinator, reception team, restaurant staff and breakfast egg chef. The bathrooms are starting to show their age however this is no major issue. Great location. Area close to beach park . A shopping mall next to it. Good variety of food surrounding the hotel. Great staff very helpful. Only set back is no free wifi. So i bought my own modemn and simcard which was much cheaper. Quick check in & room overlooking ocean & pool so lovely outlook. Balcony a bonus when visiting from Tasmania as the lovely sunshine on your face is very welcoming. Room amenities very top standard & cleaning service good. Overall a great stay & position wonderful with access to all surrounds. Business trip and hotel was just 5 minute walk from Convention Centre where conference was held. 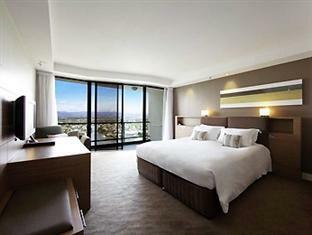 Lovely hotel, great service, good size rooms and facilities high quality. Only negative would be the breakfast buffet, had to queue for a very long time to be seated. We had a very short stay in a very comfortable room in a great location and the staff were very helpful. I left an item in the room and when I rang to see if it was there the staff were extremely helpful and called me back when they had located the item. We are having a wonderful 2 days staying, with high complimentary given to their staff hospitality. Concierge service was great who assisted us to get a local car rental. Strategic location, our walking distance to the shopping complex (Oasis) & of course night life & food hunt not the to be missed. Good location close to beach, restaurant and shops. Stayed in an ocean view room, would recommend this as views were great and nice to sit on the balcony. The swimming pool was great and service was quite goid, very friendly staff. Very convenient location. Staff helpful and polite. Clean and well appointed room. We had a perfect stay! Everything we wanted was in our room, or brought up promptly and with a smile. Beds were great and the room and bathroom both nicely decorated and spotlessly clean. Beach a short walk away, and the monorail to Jupiter's Casino (if you like that kind of thing) is accessed from 2Fl of hotel, so very convenient. Also in easy walking distance of excellent range of shops and restaurants and 5-minute drive from the massive Pacific Fair shopping centre. And secure guest self-parking was only day, which was excellent value. 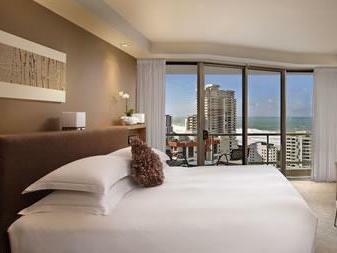 Best feature is location with easy access to restaurants, beach, shopping centre, swimming pool. 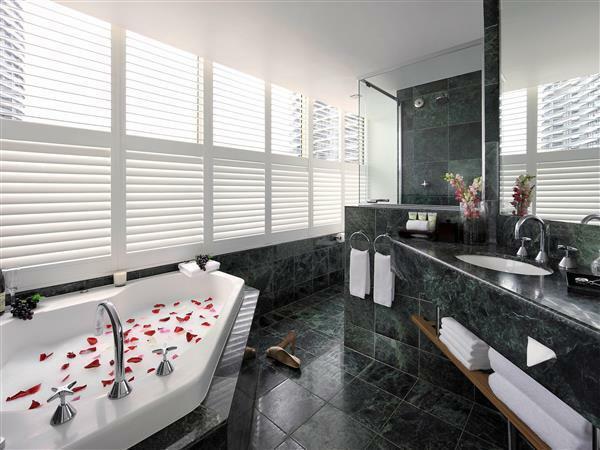 It is an old hotel, though has been upgraded significantly, with large rooms and great views. Plenty of parking, though there is a charge. Lots of options for breakfast around the hotel. Easy to catch local buses to all attractions from close by.